An incredibly easy and no-baking-required “granola”. 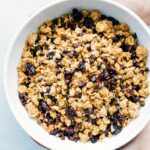 This granola makes a great breakfast or snack! It’s healthy and highly customizable to your personal taste preferences! 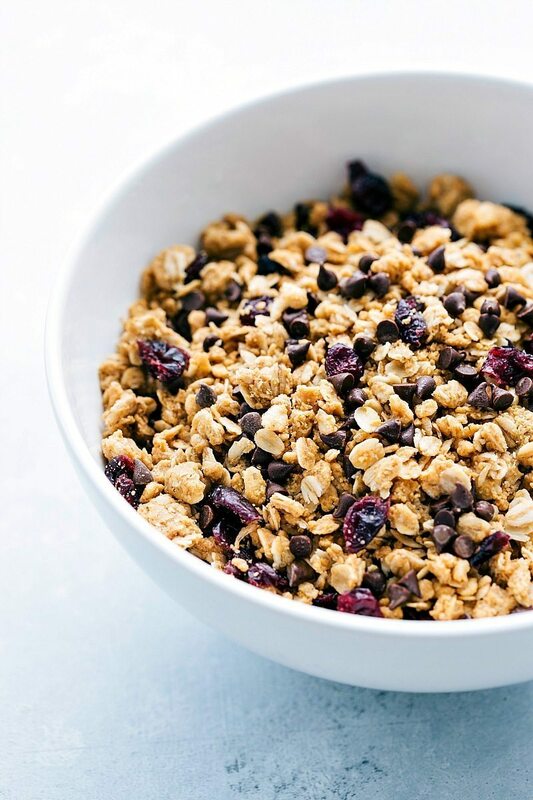 I’m a huge fan of granola; it’s one of the best snacks and one of my favorite ways to eat breakfast. I’ll usually fill a bowl with vanilla Greek yogurt and then COVER that in granola — so delicious! Since we go through granola SO quickly, I usually make a batch (sometimes even two) a week. Making granola isn’t hard, but the process can be a bit lengthy with flipping it every 7 or so minutes to keep it from burning. After burning a batch a few weeks ago, I thought wouldn’t it be nice to have granola you didn’t have to bake (!!!) 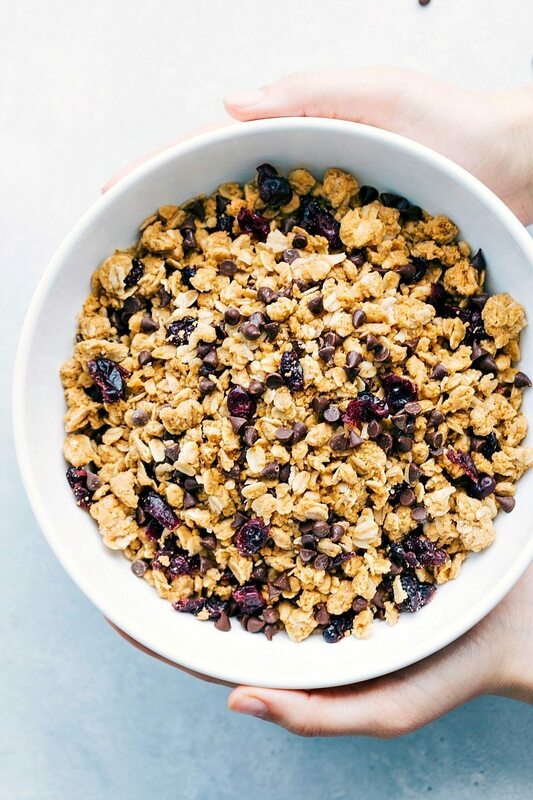 Enter this amazing “granola” that has all the flavors you know and love, but with extremely little effort. This batch of no-bake “granola” can be done in less than 10 minutes. It’s a great snack and perfect to top your yogurt or cereal with in the mornings! You can also customize the toppings to whatever you like best — raisins, craisins, mini chocolate chips, pistachios, almonds, cashews, coconut flakes, chia seeds, etc. In a small bowl, combine the peanut butter, honey, vanilla extract, and salt. Microwave for 20 seconds and stir until combined. In a medium sized bowl, combine the oats, oat flour, and rice krispie cereal. Add the peanut butter mixture to the oat mixture and stir well. It will be sticky and a little bit of a challenge to stir, but keep with it. Stir again and crumble into granola bits. I love how easy you’ve made granola-making! I totally have all these ingredients right now…along with a serious granola craving after seeing this! I’m with you on loving granola and eating it like there’s tomorrow! The fact that it’s no-bake means I get to eat is FASTER, so this is definitely worth trying. Looks delicious, Chelsea! NO bake granola??? Whaaaaaaa??? I never make homemade granola because I’m super impatient, BUT I could totally get down with this!! This Granola looks amazing! I love how easy it is to make! Will be trying this for the hubby! thank you for all the great recipes ! Do you have a granola recipe that is baked ? we like crunchy !! I actually just created one that will be on the blog early next week! 🙂 Thanks for the request Jane! Snack attack!!! I want to dive headlong into this bowl. Love the honey drizzle pic too. You nailed it! No bake granola?!? This is brilliant. Definitely could also consume this in ten minutes flat. It looks so good. And I love love love your little honey prop (totally cannot remember the name)! So cute. Yay for homemade granola! And no-bake??? That means I can eat it even faster! PS I love the new logo! Girl, you are speaking to my heart – YUM! line back in the UK and now I am going to bake your recipes, thanks! Ok, I am a HUGE granola fan! Eat it everyday esp now that am breastfeeding, as heard that it helps with lactation. It’s a quick yet healthy snack to grab and munch on, even while nursing, as I very rarely have the time to sit and eat lately. Made this today while my baby boy watched and played in his bouncy seat. SOO quick and easy! Beyond excited that I came across your site! Couldn’t have been better timing =o) it was super yummy too. Wondering though, if I did something wrong? This didn’t quite “crumble ” for me, other than a few peices, which held up nicely. what would you suggest? Maybe adding a touch more peanut butter and honey to help the ingredients hold together better? Also, how long does this typically last, and what is the best way to store it? Thanks soo so much for sharing!! We do not have a stove to use in my daycare but I made this recipe with my kids. What a HIT!!!! I loved it myself and we used dry coconut. LOL! Yay! So happy to hear that! 🙂 Thanks for the comment Anthony! Hi, this looks amazing. Does it need to be stored in the fridge?